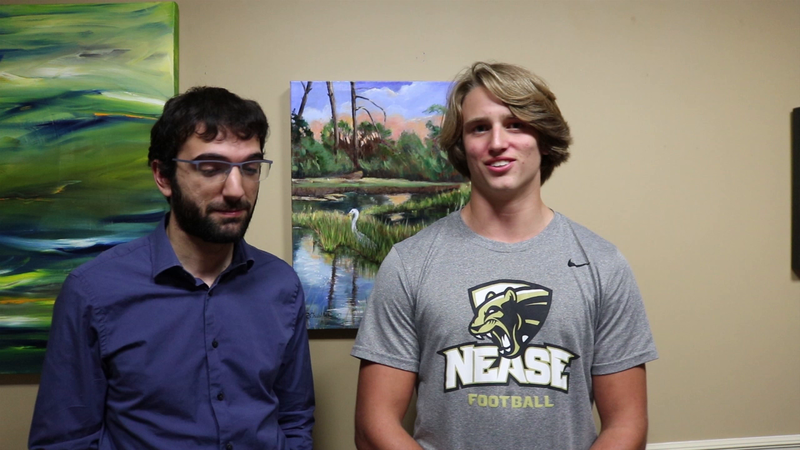 On this week’s edition of Athlete of the Week, Benjamin Naim of the Ponte Vedra Recorder spoke with Nease High School football defensive end Chase Dexter about the Panthers’ season, which ended last Friday night. One of Dexter’s biggest accomplishments this season was scoring the game-winning touchdown to lead his team to a 14-13 victory against St. Augustine on Friday, Oct. 19. With the game against St. Augustine tied at 7, you caused a fumble and ran it back 65 yards for a touchdown. Can you describe the play that led to the touchdown? It was crazy. They’ve been to the playoffs 19 years. It was a huge game for us. Everybody did their job. Our defense did great. It was a good play. What were you thinking as you were running to the end zone after making a game-changing play? How satisfying is it to make a play like that? I was super energized. My whole team was going crazy, it was a huge play for everybody. All the coaches came on the field. They hugged me. It’s a great experience. Is there a special significance to defeating St. Augustine? Yeah, they’ve been in the playoffs 19 years. We took them out of there by winning. It’s great. What do you do off the field to get better? Mornings, I work out. During school, I work out. After school, I work out. I do three-a-days. It just gets me better. I’m trying to be the best defensive end I can be, the best in my position. Just trying to win more games.